Organizer apps are not new to the iPhone platform, and recently they have become almost as common as disorganized people like me. 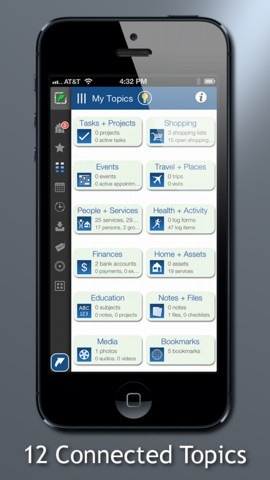 A new application called LifeTopix has been advertised as the one and only organizer app that anyone will ever need. It keeps track of your life in twelve topics: Tasks and Projects, Shopping, Events, Travel and Places, People and Services, Health and Activity, Finances, Home and Assets, Education, Notes and Files, Media, and Bookmarks. 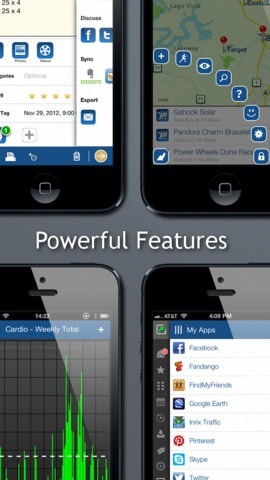 What the application really is, is twelve organizer apps in one, tied together with an interesting user interface. If you are as disorganized as I am, you are probably wondering right along with me: could this app finally be the one? Let’s look at the features to find out. This application tries to do a lot, and many people think that it may have bitten off more than it can chew. Learning to use it effectively is certainly a process. Once I learned how to use it, I found that having all of my information in the same place let the makers of the app put in a lot of neat tricks that helped me stay project oriented without sifting through a great list of to do’s. The app is iCloud supported, so it is easy to automatically sync with information entered into your computer and vice versa, which is obviously a huge plus. In addition, it functions well with calendar and document applications from Google and Apple, but far beyond that its third party support is somewhat limited. There is also built in integration with many social media sites, like Facebook or Twitter, which for some is a must in their life planning. Since this app contains so much in one place, the thing that worried me the most was that I would be constantly be sifting through a lot of information just to get to the simple things I wanted to check on. This did not turn out to be the case since there are a lot of built in shortcuts which allowed me to jump straight to the information I did want and steer clear from everything else. Most of the Topix do their job about as well as a competing app would, some do it better than the other apps I have used. The notable exception is the Health and Fitness Topix, which is pretty frustrating to use and cannot integrate with the many excellent apps on the market, like Nike+ fitness. Other than that, what I have been finding is that LifeTopix has been slowly driving me to delete the other organization apps I have downloaded over the years as I discover new features. LifeTopix is not perfect, but it is being updated fairly regularly by the producers at LightArrow. The scope of LifeTopix is so large that it can be a very daunting app to familiarize yourself with. In my experience it was completely worth it. 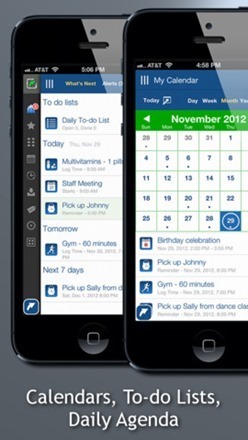 The Topix work very well together, combining shopping lists and travel plans with a flick of the fingers. While some of the Topix certainly could use some work, having all of these things in one place has already convinced me that I will continue to use this app.